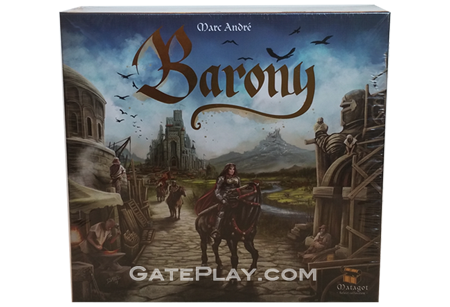 Drake says: "In Barony, players are ambitious barons trying to extend their dominion over the land! Who will succeed and become the new king?" At the beginning of the game, players create the board at random with nine tiles per player; each tile is comprised of three hexagons, with each hexagon being one of five landscape types: forest, plains, field, mountain, lake. Players then each place three cities on the game board, with a knight in each city. They then take turns in clockwise order, with each player taking exactly one action from the six possible actions: Recruitment: Add two knights to a city, or three knights if the city is adjacent to a lake. Movement: Move one or two of your knights one space each. A knight can't enter a lake (blub), a mountain with an opposing pawn, or any space with an opponent's city or stronghold or two knights of the same opposing color. If you move a second knight into a space with an opposing pawn or village, remove those tokens and take one resource from the village owner. Construction: Remove one or more of your knights from the game board and replace each with a village or stronghold, gaining one resource token matching the landscape under the structure. New City: Replace one of your villages with a city and earn 10 victory points (VPs). Expedition: Remove two knights from your reserve, placing one back in the box out of play and the other on any empty space on the edge of the game board. Noble Title: Discard at least 15 resource points, then upgrade your title: baron to viscount, then count, marquis and finally duke. Once any player has gained the title of duke, finish the round, then tally the VPs, with players scoring for resources still in their possession, their rank in the game, and the number of cities they built. Whoever has the most VPs wins. 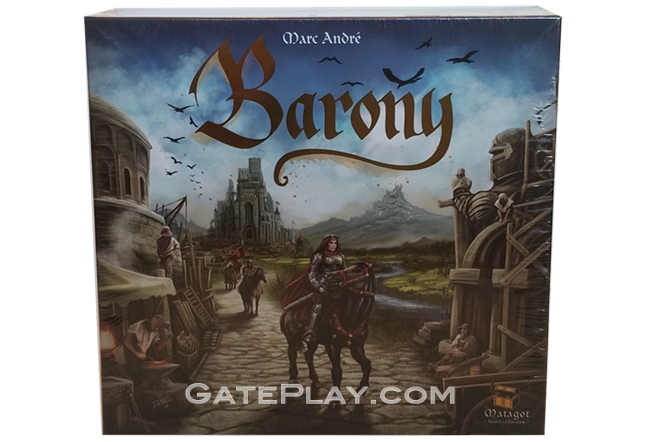 Check out "Barony" on BoardGameGeek.com!